With a million-dollar secret in his possession, a mysterious stranger travels from Australia to London to meet violent death just before he can accomplish his mission. And it is up to Rex Haig, of Scotland Yard, to find not only the stranger’s murderer but to fathom his generation-dead reason for this most bizarre of visits. Rex Haig uses a minor villain as bait to catch the killers—only to be led deeper into a baffling puzzle involving beautiful heiress Joan Hamilton; Tony Miller and his jealous mistress; operators of a confidence swindle of staggering proportions; and most bizarre of all, the mad occupant of the gloomy, castle-like Towers—an old man whose passion is playing with dolls! 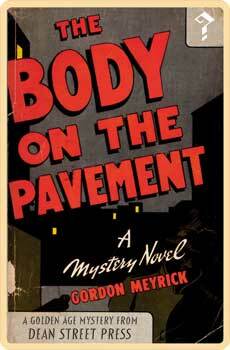 The Body on the Pavement was originally published in 1942. This new edition includes an introduction by crime fiction historian Curtis Evans.